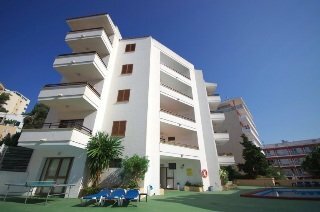 This apartment complex enjoys a fantastic location, only some 80 m from the sandy beach. An array of shops and entertainment facilities, as well as a public transport stop, are to be found approximately 130 m from the building. Palma de Mallorca Airport is located roughly 22 km away. This welcoming apartment complex comprises a total of 16 accommodation units spread over 4 floors. Guests are welcomed in the inviting lobby, which houses a 24-hour reception desk, safes, a currency exchange desk and a lift. The complex also has parking spaces and free wireless Internet access. Modern and bright, all of the apartments feature a fully equipped bathroom, satellite-cable TV, a separate kitchen, a fridge and a hire safe. Each of the apartments has a lounge with a sofa bed and two separate double bedrooms, as well as a terrace. In the green grounds, there is a swimming pool, as well as sun loungers and parasols.